It's hard to believe there was a time--not too long ago--when 2 Amys was viewed as the only serious pizza game in town. My how things have changed. Today, Washingtonians have an almost embarrassing selection of riches when it comes to finding good pizza. Comet Ping-Pong, which celebrated its 10th anniversary last weekend, perfected the casual vibe of a neighborhood pizzeria with decidedly fine quality wood-fired-oven pizzas. Wiseguy NY Pizza satisfied that craving for New York-style pizza without going to The Big Apple. And the 14th Street crowd are in good hands with the pies from Etto, a 2 Amys offshoot, and Ghibellina. I've enjoyed quite good pizza at Ardeo, Arcuri, Graffito and Vace. Almost every style of pizza is well-covered here, save for good Chicago-style pizza, which is MIA since the closure of Armand's Tenleytown a few years ago (and yes, I'm aware of District of Pi--the less said, the better). A few other places I haven't visited, such as Il Canale and Menomalé, also draw rave reviews. And while it's not exactly "gourmet," an Adams-Morgan Jumbo Slice certainly hits the spot in the wee hours of the morning after a night of bar-hopping. Against this backdrop of seemingly endless choices for crust, sauce, cheese and toppings, I was skeptical when I heard that D.C. was getting yet another pizzeria with All-Purpose. Sure, it was opening in Shaw, the city's white-hot restaurant neighborhood, with a prime slot near 9th & N, a geographic focal point of the D.C. new food boom. That skepticism quickly vanished after my first visit to the handsome and inviting establishment. My first trip to All-Purpose was at lunch, just days after Washington Post restaurant critic Tom Sietsema named the restaurant his favorite in the city for his annual Fall Dining Guide. I arrived early, expecting it to be busy, but was actually surprised by how sparsely packed the dining room was (note to All-Purpose fans: weekday lunch appears to be a good time to get a table here. Second note to All-Purpose fans, unlike other hot D.C. restaurants, they take reservations! Yay!). With the piling accolades, I was expecting something fancy, but All-Purpose has a very casual, laid-back vibe, with bare wood tables, wood paneling and tile flooring (all those hard surfaces, while lovely, do make for a pretty noisy restaurant when it is busy). All-Purpose's warmth doesn't stop at the decor. The staff is quite friendly too. Both during my lunch and dinner visits, I encountered friendly hosts, managers and servers, the last of which were efficient, attentive and prepared to answer questions. I even got to chat with one of the cooks who came out of the kitchen to tell me how they make their dough (more on that later). Starting the evening with a cocktail isn't a bad idea. All-Purpose's drinks list includes a short menu of classic cocktails like a Black Manhattan, an Italian spin on the whiskey classic that substitutes Averna for sweet vermouth. There's also a short list of European and American wines by the glass, a longer list of beers and a quite long list of wines by the bottle. And the pizza? It's divine. Absolutely among the best pizza I've had in D.C. or anywhere. 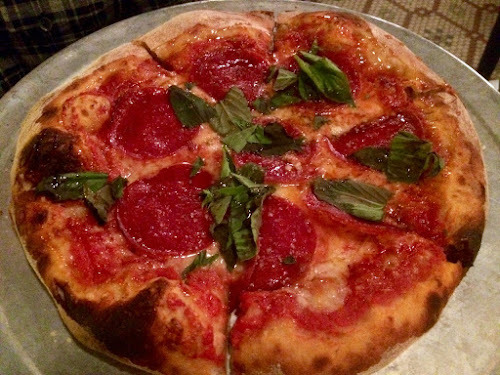 During my first visit I ordered the Buona, quite possibly the best pepperoni pizza I've had in my life. It's insanely good. Simple too: large slices of pepperoni, chili-honey (basically lightly spicy honey) and fresh basil top a traditional base of mozzarella and tomato sauce. I'm getting hungry writing about it. It was so good that when Chris and I went for dinner a couple weeks later, I insisted he try it too. 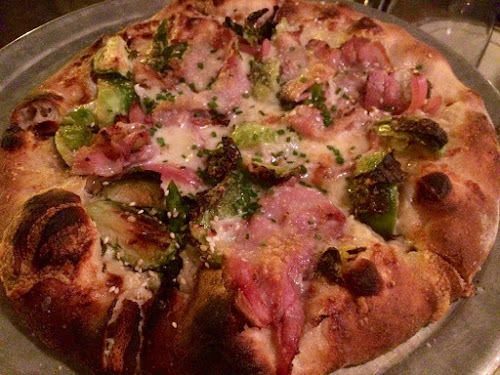 We also got the Sleepy Hollow, a seasonally delicious mixture of roasted Brussels sprouts, pancetta, smoked mozzarella, onion and tomato sauce. As much as I loved the Buona, it would be hard to say I preferred it over the equally masterful Sleepy Hollow. All-Purpose pizzas come in an individual size, so ordering several and sharing (or if you must, one for yourself) works great. Although pizza is clearly the focus here, All-Purpose offers a few other entrees, including a lasagna, and quite a few small plates. At lunch, there are also some sandwiches. 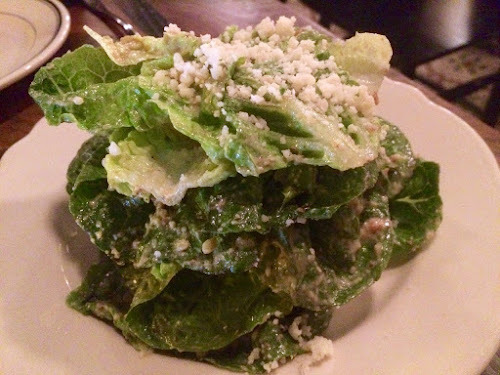 During dinner, we started the evening with a fresh-tasting Caesar salad, which arrives as a stack of little gem lettuce leaves coated with a nicely acidic anchovy dressing, parmesan and breadcrumbs (quite small, so don't expect croutons). If you like the Caesar, it also shows up at lunch as the Cape May pizza, which I haven't had but hear is another standout. Now let's talk about that pizza crust. You know how sometimes you eat pizza and skip eating the final arc-shaped piece of crust without toppings? (Yes, I know this practice is anathema to many of you, but some employ it as a way of portion-control.) Well, you won't want to do that here, because the crust is absolutely delicious. This is where chef Mike Friedman has gotten quite inventive. All-Purpose uses a blend of flours that includes whole-wheat flour--unusual, since most pizza just uses all-purpose flour (sort of ironic, given their name). It also incorporates malt powder, which gives the yeast an additional source of fuel while also providing caramelization for the crust when it bakes. Then, the dough is aged for 3 days, allowing for significant fermentation. The pizzas are baked in a deck oven, rather than the trendy wood-fired oven. If you're hankering for dessert, All-Purpose has a partnership with Tiffany MacIsaac's next-door bakery, Buttercream, an inspired establishment in its own right. Although the cakes sound amazing, we split a delicious dish of peanut-butter soft-serve ice cream with caramel sauce and cookie crumbles (the menu said it had a concord grape element too, although I couldn't discern that by taste). If you're thinking of skipping dessert, at least stop next door and pick up a few of Buttercream's wonderful cookies for later. You won't regret it, nor will you regret giving this gem of a pizza restaurant a chance. All Purpose, 1250 9th Street NW (near M Street across from the Walter E. Washington Convention Center). (202) 849-6174. Reservations: Resy.